Improve the accuracy of your sales forecast with five actions you can take today that will improve your sales forecast accuracy tomorrow. Heaven knows how many tactics have been tried over the years to improve sales forecast accuracy. Sadly, the almost mystical practice of forecasting is still very much based on supposition and gut feel. As sales leaders, we sit at our desks today, trying to steal a glimpse into the future. We are forced to make gut feel assumptions about the health of our deals based on the word given by our sales reps.
As a result, we often feel powerless in our attempts to deduce what will truly happen at the end of the quarter. One ray of hope is that nothing is preordained and the actions we take today have a significant impact on our tomorrow. So, we can breathe a collective sigh of relief. We have discovered that the key to improving sales forecast accuracy lies in behavioural analysis. Therefore, by unlocking this data, we can finally do away with the out-dated sales rep interrogation & sales manager guessing games. Excluding a few gifted clairvoyants, it’s fair to say, as sales leaders, we can’t see into the future. The future is, therefore, a whirlwind of confusion for us all. Furthermore, we know that the good steps we take today will lead us to our desired outcome tomorrow. But to lift our forecast from the realms of guess work, we need more than gut feeling and hope. To take the necessary steps today that will guarantee success tomorrow, we need to first look behind us and map out the repeated behavioural patterns of successful previous sales engagements. And for this we need data. However, when it comes to behavioural analysis, the data currently available in our CRM system just won’t cut it. You need behavioural data. Data taken from the high-value activities your reps are performing. It is this data that shows the true health of your pipeline. What high-value sales activities have, in the past, worked positively for you and your team? e.g. C-level contact achieved early on, early line of sight for the legal department. We would confidently bet that you probably already know what these are. What qualities previously signalled the unsuccessful outcome of your target? e.g. close date repeatedly stuck in the past, sales stages that bounce backwards and forwards. Again, we would confidently bet that you know what bad practices hinder your deals. With a clear understanding of what, in the past, has worked and what has not, you can quickly close the gap between uncertainty and reality in the future. It is important to explain what we mean when we say monitoring behaviours, as these are very different from tracking activities. Activities are the simple actions we make almost by inertia. Our boss has told us to make 20 calls every day. So we pick up the phone, dial 20 times and tick that box for the day. There’s no innovative thinking behind that. On the other hand, behaviours are rational and habitual. They are born from experience and are responsive to a given situation. After reaching the desired outcome through that same behaviour more than once, they start to become habitual. We no longer make 20 calls a day because we are told to do so. We instead know the best time to call the specific contact, upping our chance to hold meaningful conversations rather than reaching 20 answering machines. Most noteworthy though is that the highest value behaviours have a specific timing and cadence associated with them. Something that CRM systems are simply not able to track or identify. Your reps are probably not using the CRM system as they should. They forget, they don’t like it, they don’t see the personal benefit it brings and so the content is incomplete, out-dated or absent. The data presented is very much a static view of what the deal looks like today. There’s no real data to tell you what that deal looked like yesterday (before your rep changed the Close Date from past to future ahead of your sales review meeting) and consequently, you have no real picture of what it may look like tomorrow. To improve sales forecast accuracy, the first thing we need to do is perfect our current process, today. Remember when we talked about how today’s actions impact tomorrow’s outcomes? Well, now is when you need to act. You’ve got the technology, now you need to invest in a solid forecast methodology to build around it. Stop seeing CRM as a stagnant place where people seldom deposit information. In conclusion, you should start seeing your CRM as the centrepiece your business gravitates around. Additionally, you should view it as the historical behavioural archive from which to make stable predictions. 1. Reward your users for the positive use of your CRM. Reward your reps for every meeting note they complete, every future dated call they book, every piece of customer knowledge they share. Ensure your users understand that ‘if it’s not in the system, it doesn’t exist’. Hold forecast meetings with this updated, real-time data in front of you. 2. Pinpoint your ‘winning way’. Work out the set of actions or steps that your successful reps take that most often result in successful outcomes. What for your top reps is simply good practice, is a goldmine of innovation for you and an example to follow for the rest of your team. 3. Monitor the health of your sales forecast, daily. Track high-value “winning” behaviours. They provide an early warning system for your sales process. Remember, CRM alone cannot give you a clear view into the health of your deals. It can only give you a view of what your users made it look like today. Insist only those deals exhibiting healthy behavioural signs stay in the forecast. If the information stored in the CRM system is not regularly looked after, warn your team members it will not make it onto your sales forecast. And in turn, it will start diminishing their credibility. Good forecasting is an iterative process, don’t get caught up on your early predictions. Build your sales forecast early on and allow new data to discredit your initial calculations. Monitor, review and modify often. Finally, it’s worth pointing out that these are a few ways to increase sales performance! There are many more secrets to getting the most from your existing sales team. 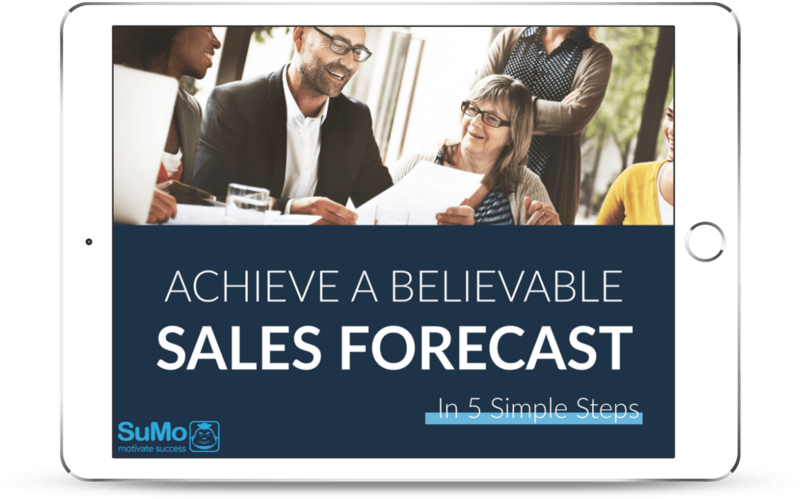 If you’re hungry for a little more sales performance inspiration, we’ve got this eBook covering the 5 steps to achieving a believable sales forecast.